As I shoved and was shoved by the PAX East mob yesterday morning, Homesick caught my eye—looking all spooky at the Indie Megabooth as it was—so I stopped to chat with its creators. 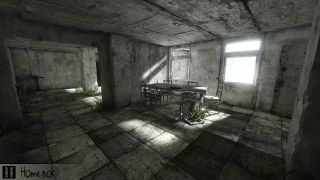 The show being much louder than it seems in this video, I didn't hear much of what they said, but thanks to a microphone, we've learned that Homesick is a puzzle-exploration game set in an abandoned building, and it'll be on Steam soon. It's also got some very nice-looking urban decay, which co-creator Barrett Meeker accomplished single-handedly.